Life's Journey To Perfection: 2016 LDS Sharing Time Ideas For February Week 1: Heavenly Father has a plan for me. 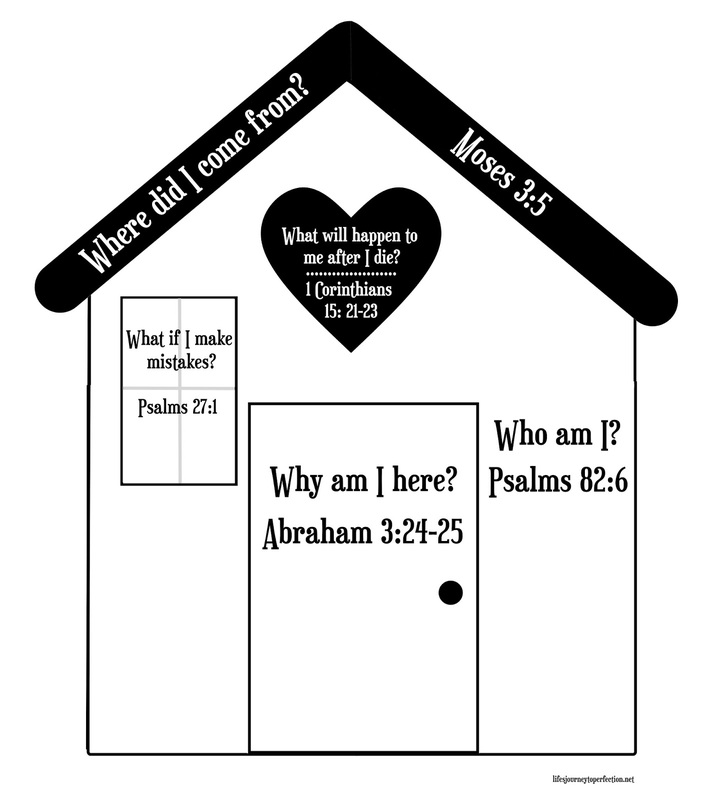 February Week 1 Topic: Heavenly Father has a plan for me. Print off a picture of a house and house plan (I just googled Printable house plans and found some), Print the printables above. Begin Sharing Time by showing the primary children a picture of a house (see prepartation). Ask the children, "If they were told they needed to build this house, how would they know how to build it?" They would need a plan, right? Show the primary children the plan that goes to that house. Explain that in order to build the house correctly we need to have a plan, or instructions to help us to know what to do. 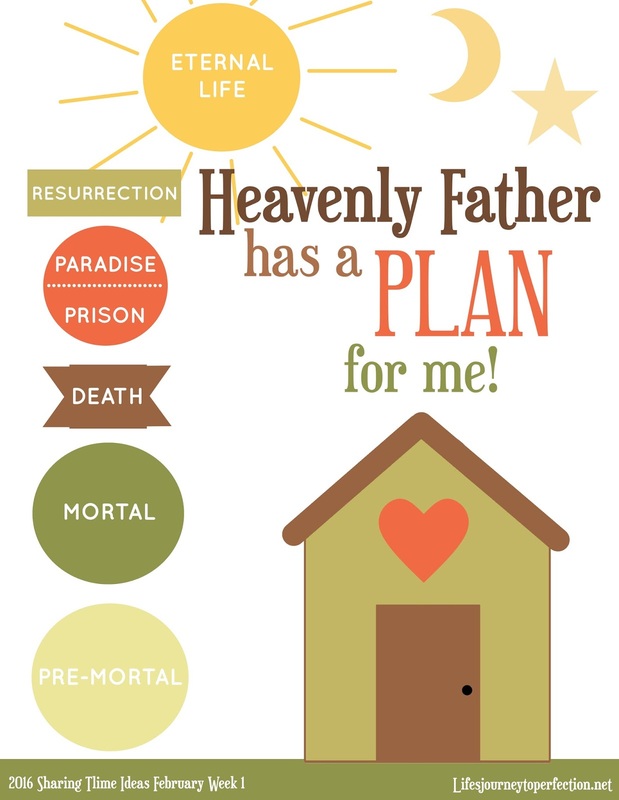 Show the primary children the week's theme poster and invite them to repeat, "Heavenly Father has a plan for me". Explain to the children that Heavenly Father loves them so much that he has a plan for them, and we can learn of Heavenly Father's plan in the scriptures. Show the children the scriptures. On the board have randomly placed parts of the house (see the printable above). Explain to the primary children that we are going to build a house, as we use the scriptures to learn about Heavenly Father's Plan for them. Invite a primary child up to pick the first piece that will be needed to build the house. (First piece would be the main part of the house that says Who am I? on it. Second piece, is the roof, third piece is the door, fourth is the window, and fifth is the heart) Have them wear the construction hat (or tool belt). Read the question to the primary children. Give them the scripture reference and invite them to look up the scripture. Invite one of the primary children to read the scripture. Then ask the primary children to answer the question. Invite that primary child who came up to build the house, to place the house piece in the right spot. Then invite another child to come up to build the next piece. Continue until all the pieces of the house are built. Close by sharing your testimony of Heavenly Father's Plan for us and that we can learn of it by studying the scriptures. I was just looking at your labels on your sidebar, holy crow you have a huge index of resources and posts! It's amazing! You always have great ideas Kim! You are incredible! Thanks for sharing your talents and making my life so much easier. I love how close you stick to the outline. This is my first time in a primary presidency and February is my first month teaching sharing time. I've looked over all 4 weeks for February and love it. I tried week 1 out on my family for FHE and it went well. Wish me luck and thanks for the printables! Yay Jen I am so excited for you! You will do amazing 😊❤️ Best wishes & thanks for commenting! This is my first time in a Primary Presidency and my first month of sharing time too. I love these ideas! It allows the kids to be more involved. Thank you so much for your help! I was thinking how ironic it was that the sharing time lesson stated "the scriptures teach us that Heavenly Father has a plan" and then failed to have any scriptures references at all. Thank you for giving me a great place to start! You planned out exactly what I had in my mind to do. This year is a perfect time to implement putting scriptures into sharing times :) Thanks so much for your comment!! Thank you for all your wonderful work! You help make my life easier and sharing time much more enjoyable for our little friends!! Thank you! this is just what I was thinking! Oh no Jackie! I have got on both on my PC and my phone and pulled up the download, both are working. Are you signed in to your google account? Sometimes that will make a difference. Sorry let me know if you are having more issues and I can e-mail it to you directly. Thank you so much Michele for you amazing comment :) Brought a smile to my face tonight! Thanks!